I've mentioned a few times in previous posts, that I've been busy making artwork and home projects, that I haven't posted. I'm trying to find some normalcy and flow back in my life again. 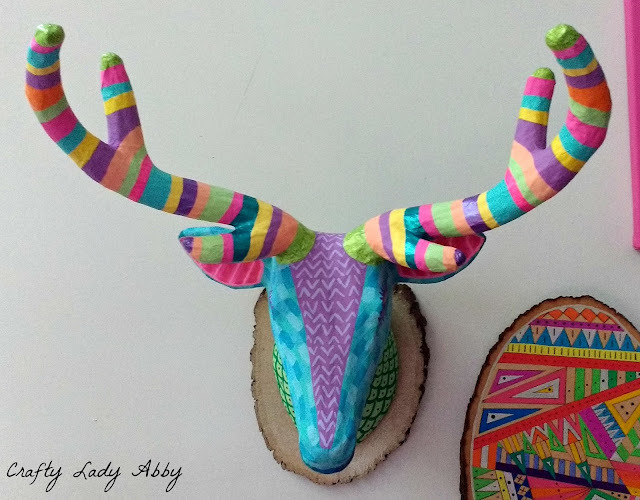 Back in July, I painted a paper mache deer head, with DecoArt products. The base is a Walnut Hollow wood slice, I repurposed from this project. I needed a creative release and this deer head had been lingering around for about a year. Faux taxidermy has been a big thing over the past few years. 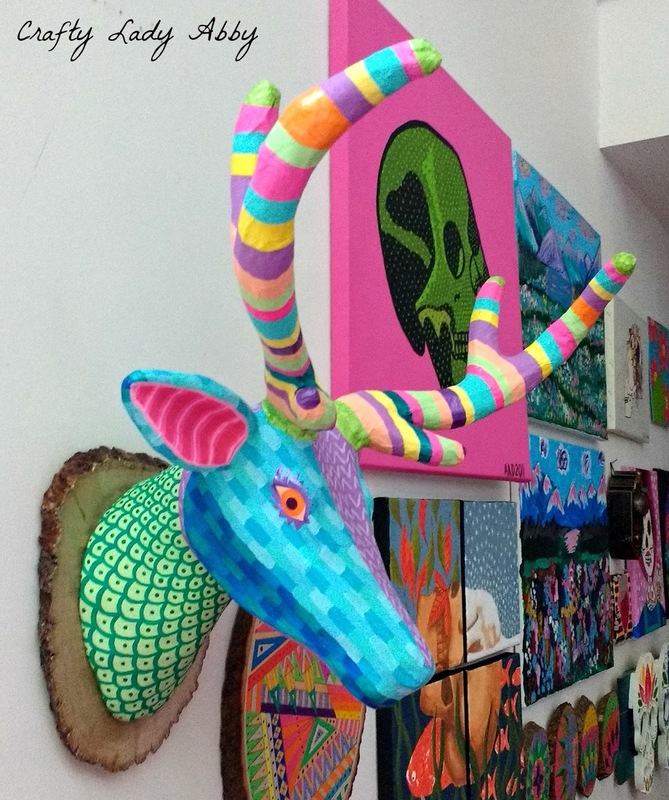 However, like many craft trends, it has been oversimplified to deer heads in all white or gold. Blahhhhh!!!! I wear a lot of black, but I love my artwork to be colorful and whimsical. The bigger and brighter, the better really. Years ago, I saw a few deer heads that artist Hope Perkins painted and embellished. 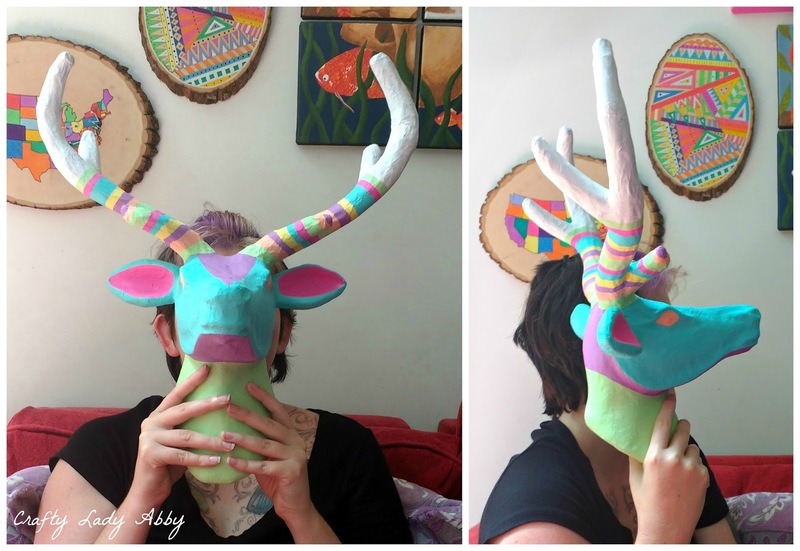 Now these are real deer heads, but her makeover style was great inspiration for my paper mache deer head. In the finished photo, you can also see my growing gallery wall. If you've followed me since the days I was making mostly skull art, you'll notice a few familiar pieces. The big pink and green painting is #34: Pop Art Skull. The four little paints below that are #69: Skull of Seasons. The wood pieces are Geometric Wood Trivet, floral coasters, Sugar Skull Trio, and USA Road Trip Map (which needs additions from our Hawaii trip). The two landscapes, my daughter and I did at a painting party for my eldest niece's 18th birthday. The little striped lady painting, I bought from Jennifer Perkins (Hope's sister). Beside that is a Frida Khalo sugar skull portrait, my friend KT made for me. Above that is a Nazca skull piece I made back in 2010, before I learned how to paint. I used a paint marker and crayons for that one. Beside that is a cat silhouette of Pippi I made, inspired by Meg Allan Cole's Dog Silhouettes. At the very end is #12: Skull with Flowers, which was one of first nice acrylic paintings, and the start to the crazy painting adventures that have followed. Here are some progress shots. If you follow me on Instagram, you can see lots of progress photos from all my projects. Including the bathroom demolition that's happening as I type this. We hired professionals to remodel our two terrible full bathrooms into one glorious huge bathroom. The half bath got a new toilet. It will get some DIY love soon. I left the master bathroom to the pros. Anyway, back to the deer head. Above, you can see the scale. Below, you can see the process of adding details. 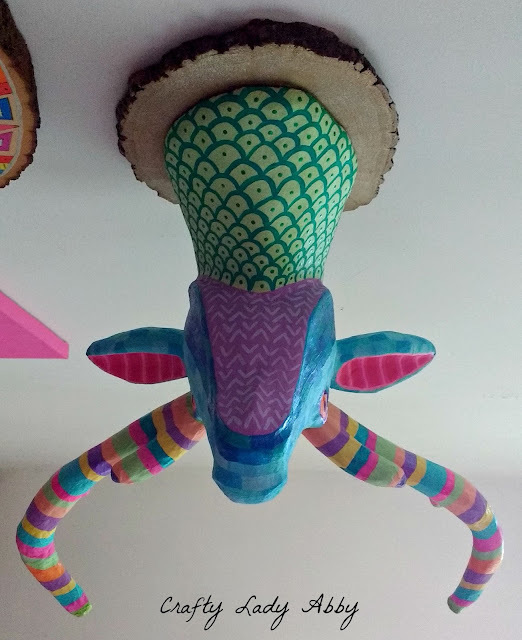 Striping those horns took a long time. 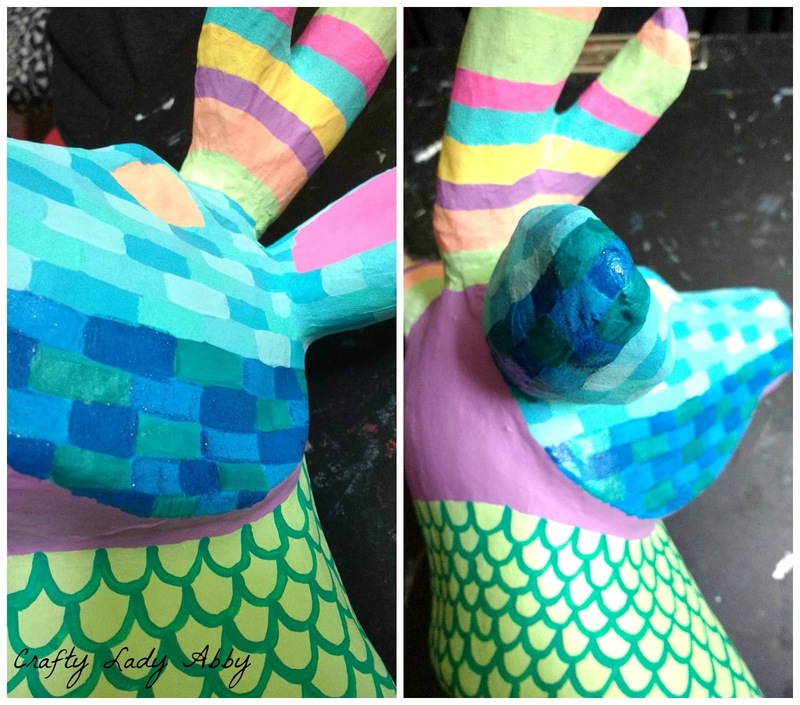 I should also mention, I used layers of white gesso on this deer, before painting, so the colors would all pop. A wonky front shot. The wood round is gold and metallic brown. You can also see the shiny metallic and glittered horn stripes. We're going for whimsical folks, so a little shimmer is always good. The purple disconnected chevron pattern, goes from the nose, around the back, to under the chin. You can see the slivers of where that all connects. That's all for now. I'm over here working on Halloween costume pieces, and listening to the noises of a destroyed bathroom. It's intense. There will be posts about this huge makeover, but not for a while. I want to have some pretty photos of the final bathroom to include. Right now we have photos of two boring white and cream bathrooms (or as my mom's best friend called them "vanilla"), and the destruction stages of both. Ok, enough chatting. Time to work that sewing machine for all it's worth...or um not that hard.